DI-Flux Magnetometer, Proton Precession Magnetometer - IIG make. 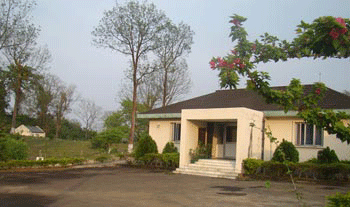 Silchar magnetic observatory was commissioned in 1998 in the campus of Regional Engineering College under a project sponsored North East Council to understand the Earth’s electrical conductivity beneath the surface. The observatory is located southern side of Dauki fault. Thus magnetic measurements at Silchar complement the measurements at Shillong which is situated on the northern side of the fault. Due to developmental activities, leading to increased electromagnetic noise in the vicinity of the observatory, magnetic records at Silchar were found to be contaminated with electromagnetic noise. The Assam University, Silchar has allotted land to relocate the observatory in an isolated low electromagnetic noise locate. The Observatory started its functions at this location in October 2011 where induction coil Magnetometer along with other magnetometers is monitoring geomagnetic field variations in a wide frequency band.